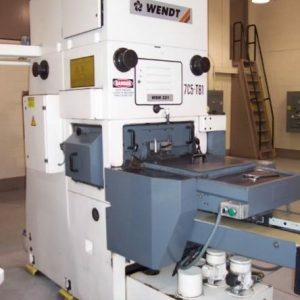 A double disc grinder grinds two sides of a workpiece at the same time. This provides a high degree of flatness and parallelism. For parts like piston rings that need to be ground flat on facing sides, a double disc grinder will cut production time in half. There is no need to grind the same part twice; this also reduces stress on the part. Double disc grinders are a fine grinding process and can achieve extremely close tolerances, often similar to what lapping can achieve. 847-276-2761 or send us an email sales@libertymachinery.com. 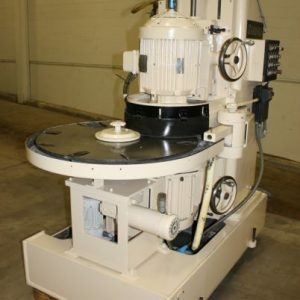 Liberty Machinery buys and sells all kinds of double disc grinders. We are your #1 source for a high quality double disc grinder. All double disc grinders have two grinding surfaces facing each other, with the workpiece sandwiched in between. The difference lies in how the grinding wheels are oriented and the way in which the parts travel through them. There are four possible types of feed system. A rotary fixture or carousel fixture type has a flat circle with holes into which the workpieces are placed, as pictured above. This whole plate spins, passing each of the pieces between the grinding wheels. 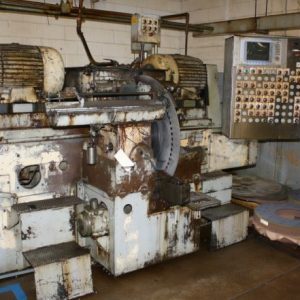 A feed through fixture type uses a power feed to pass the workpieces straight through and out of the grinding area. 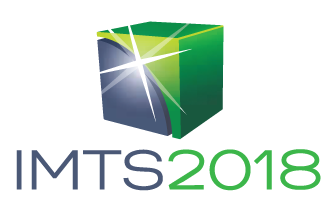 A reciprocating fixture type is used for heavy stock removal or extremely close tolerance requirements. The workpiece is held by a paddle-type fixture that moves back and forth, passing and re-passing the same piece through the grinding area. Finally, special fixture types are custom-built for workholding that cannot be accommodated by the normal types. Liberty is always looking for used double disc grinders to buy for inventory. Contact us and let us know what you have for sale. We’ll be happy to give you a free quote. 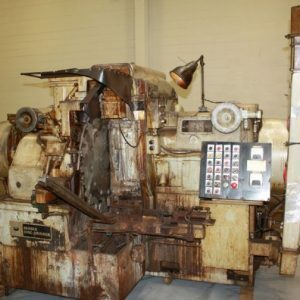 See our used double disc grinders for sale. Michael Paquin, "Double-disc Grinding on the Move," Modern Machine Shop (December 1995). Gardner Disc Grinders & Abrasives, Inc., "Gardner G Series Double Disc Grinders" (brochure). 1994.